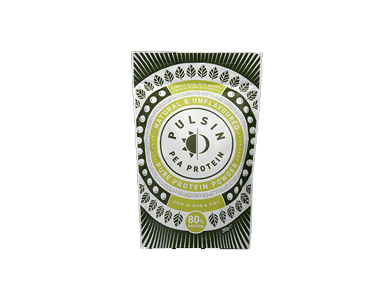 We sell Pulsin' products like Pure Pea Protein - 250g online in the UK and directly from our award-winning store in Scotland. Pulsin' 100% Pea Protein isolate is one of nature's most complete and nutritious plant protein sources. Pulsin' pea protein is made from yellow split peas; just one serving is a big step towards your 50g recommended daily protein intake. Pulsin' pea protein is sustainably grown without the use of pesticides, herbicides or fertilisers. Sprinkle Pulsin' pea protein over cereals or get creative with casseroles and soups. Recommended serving: A 10g serving provides 8g of protein. Use 1-3 servings a day. This vegan recipe is full of flavour and all the family can enjoy it, it's a deliciously hearty and healthy veggie curry that tastes delicious and is simple to make and packed with protein. This recipe contains 1 tblsp of pea protein powder (optional). We sell real Pulsin' and other Protein Powders directly from our shop in Scotland and online throughout the UK. View more products from Pulsin'. Where can you buy real Pulsin' Pea Protein Isolate 250g safely online? If you are wondering where you can buy Pure Pea Protein - 250g safely online in the UK, then shop with us. We are an actual health foods shop; with real people selling real foods and products. Our award-winning independent shop is located in Stirling, Scotland since 1976. You can buy our Protein Powders in store or safely place an order with us online or over the phone. Pulsin' Pea Protein Isolate 250g - Pure Pea Protein - 250g in Protein Powders and Herbal Remedies, Tinctures & Supplements.